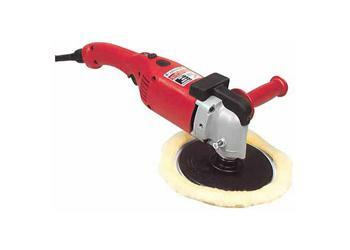 Milwaukee Polishers are built with a powerful 11 amp motor that provides plenty of power to maintain the right speed. A trigger speed control switch allows speeds of 0-2800 rpm. This versatile model will accept 7 inch or 9 inch accessories. A spindle lock for convenient, quick accessory changes is standard. A QUIK-LOK® cord set allows quick detachment of the cord from the tool for tangle free carrying and storage. Built for a long life this tool includes helical gearing, all ball and roller bearings and an aluminum gear case with protective urethane bumpers.